The Buick Special was the last model to receive a new full-width body, in mid-1949 as a 1950 model. Before that the Specials were basically Fisher B-bodies dating back to 1941. The new model was introduced with a “snaggle-tooth” grille, which spilled down over the bumper and was also fitted to Super and Roadmaster models. Specials had three “ventiports” on the hood sides. The 1950 Specials were divided into two lines. The base model had no body-side moldings, while the Special Deluxe had trim, bright window outlines and “Special” script on the front fenders. Three body styles were available in the Special line, with four in the Special Deluxe. Each had a fastback, or “Jetback,” two-and four-door, as well as a conventional notchback four-door touring sedan. There were no Special convertibles or station wagons and the top seller was the four-door touring sedan with 141,396 sales. Power came from the 110-hp, 248-cid OHV straight-eight engine, with a three-speed or optional Dynaflow automatic transmission. As Buick’s affordable option, Buick Special prices ranged from $1,800 to $1,983. For 1951, the Buick Special grille was modified to a more conventional waterfall design, and the Special line gained a convertible and a Riviera two-door hardtop. The Jetback style was dropped, to be replaced by a more conventional notchback form. The straight-eight engine was increased to 263 cid and 120 hp. Little changed in the 1952 Buick Special lineup, with just a curved side molding and a gravel guard appearing. The base model had a two-piece windshield, while the Deluxe had one-piece. A steel strike and the Korean War cut production of the Special to 120,898, with only 600 of those being convertibles. All Specials were Deluxe models in 1953, and this was the last Buick to use a straight-eight engine. Standard power output increased to 125 hp, though an estimated 80 percent of the cars produced were equipped with automatic transmission, which bumped ratings up to 130 hp. Buick changed over to 12-volt electrics this year. The 1953 Special was the last year of the immediate post-war body, with its swooping fender line; the 1954 models would be much boxier. 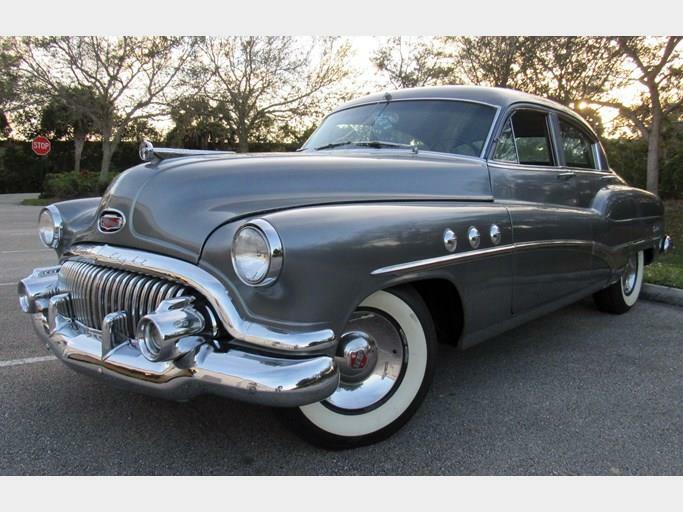 Well-built if leisurely performers, many early 1950s Buick Specials have survived. The Specials are smaller, and therefore somewhat more convenient. Many linger in wrecking yards and spares are reasonably available. The only annoying issue can be the Dynaflow transmission, as the prop shaft driveline requires removal of the rear axle, in order to repair leaking seals.